STOP HS2 | HS2 costs increase by over £1bn, but not according to HS2 Ltd. The costs associated with Phase 1 contracts of HS2 have increased by £1.15bn, an increase of 11% since November last year, whilst some costs do not now appear in the budgets for contracts to be tendered on. The biggest increase is that of the cost of the surface route, which has risen 41% from £2.7bn to £3.8bn. Despite it being clear that the overall costs of six contract headings have increased, an HS2 Ltd spokesman told Construction News that this did not reflect an increase in costs, claiming: “Categories have been changed and repackaged to reflect industry feedback and our own ongoing design refinements”. According to HS2 Ltd, this table does not represent an increase in costs. Whilst it is true that the original heading of ‘enabling works’ and the original associated £600m cost has now been redistributed into other headings, this does not change the fact that the total value of contracts announced in November last year was £10.65bn, and now it stands at £11.8bn. On top of that £1.15bn increase, an unknown amount needs to be added for Euston station development and ‘some elements of railway systems’, which for reasons best known to HS2 Ltd have been excluded from their figures. All costs are still calculated on 2011 figures, despite the fact the main elements of construction are not due to even start until 2018. 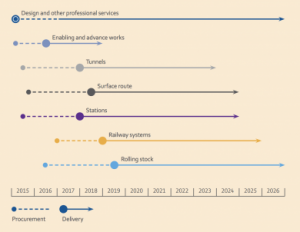 A gantt chart showing HS2 Ltd don’t really care about Parliamentary process. These figures have been released as HS2 Ltd start their procurement process, which HS2 Ltd intend to result in contracts being signed before the HS2 Hybrid Bill gets Royal Assent. Speaking at the HS2 supply chain conference last Friday (17th Oct), HS2 Ltd CEO Simon Kirby told delegates that HS2 Ltd plan to procure consortiums on a two-stage design and build basis before the Hybrid Bill gets has got the final approval from MPs and Lords. HS2 Ltd also intend to start enabling work on Network Rail sites prior to Royal Assent in 2016, with another set of contracts on ground investigation, already out for tender. The latest news is that the NHS will need significant investment over the next 5 years as part of the current Government’s plans. Despite all the cutbacks, Government borrowing is still far too high. 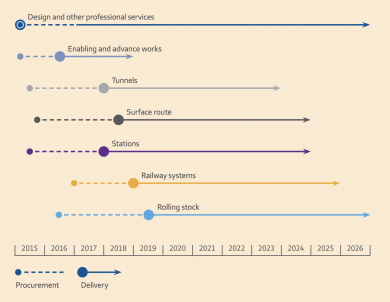 How on earth can HS2 still steam roll on? Just about about every argument put forward by HM Gov and HS2 has been negated. In the name of sanity, the project should be cancelled before any more millions/ billions of our money is wasted. Perhaps those in favour cannot see the bleeding obvious!